That is how long it took for the Nuggets to finally break a nine-game losing streak at the hands of the Houston Rockets, who have been the Nuggets’ kryptonite over the past three seasons. For over three years, the Nuggets searched for answers, but found none. That all changed on Friday night in the Mile High City, as the Nuggets finally said enough is enough and tore apart the Rockets, 136-122. “We know that we’ve lost nine in a row so we knew that we wanted to come out and beat them,” Malik Beasley said after Denver’s thrashing of the Rockets. One of the strangest phenomenons in sports is the mental walls certain teams or players will develop. Suddenly, the best shortstop in baseball forgets how to throw to first base or an All-Pro running back cannot stop fumbling the football. These struggles take on a life of their own and become trends that players or teams cannot overcome for long stretches of time. For the Nuggets, that phenomenon had been exemplified by Denver’s winless record over its last last nine games against the Rockets. For Denver — who had already grabbed statement wins over the Golden State Warriors, Oklahoma City Thunder, Portland Trail Blazers, Toronto Raptors, Philadelphia 76ers and the Boston Celtics among many others — there was only one elusive statement win and it was a victory over the Rockets. Game after game, the end result seemed inevitable for the Nuggets whenever they faced off with the Rockets. Denver would be completely unable to slow the pick and roll attack of James Harden or Chris Paul with Clint Capela rolling to the rim so they have to send help. When they send help, players like P.J. Tucker and Gerald Green begin to hit open 3-pointers. When role players begin to hit 3-pointers, Denver’s defense can’t help into the paint as hard which eventually led to Harden going on an obscene scoring tear. It did not matter what Denver did. When it came to the Rockets, it seemed all but impossible to secure a win for more than three years. It was not easy, but the short-handed Nuggets found a way to overcome the Rockets and they used their confidence as their most powerful weapon en route to their 36th win in 51 tries. So, why is it that the Nuggets incredibly young roster is so supremely confident in their abilities? It all starts with the mentality of their head coach; a mentality that has now seeped into the mindsets of each and every player on the Nuggets roster. Simply stated, the Nuggets prepare for each game in an identical fashion. It does not matter if it is the Rockets or the Phoenix Suns. Denver comes into each game worrying about themselves and expecting to win. On a brisk Friday night in Denver, the Nuggets came into their matchup with the Rockets expecting to win despite being without their starting back court in Jamal Murray and Gary Harris. As he has all year, the depleted Nuggets were led by Nikola Jokic who put up a near triple-double with 31 points, 13 rebounds, and nine assists in his first game since being selected for as a 2019 NBA All-Star. Jokic was not the only player to carry Denver to one of the biggest wins of the year. 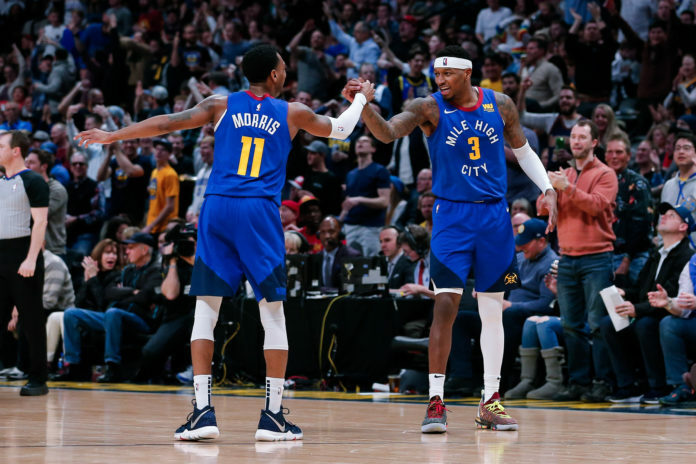 With both Murray and Harris out, the Nuggets needed their reserves to step up once again and they delivered in a big way. Beasley had a career-high 35 points and it only took him 17 shots to do so. Torrey Craig was flying around all game as if he had been shot out of a cannon as he racked up a career-high 22 points on 8-of-11 shooting. Monte Morris was also huge as he contributed 18 points on 11 shots to go with six rebounds, eight assists, and just one single turnover. The Nuggets needed to embody the ‘next man up’ mantra and that is exactly what they did. Now, with a win over the Rockets officially secured for Denver, their already extreme level of confidence is rising higher and higher; so much so that Beasley feels that the Nuggets are the best team in the league. The entire Nuggets roster, coaching staff, front office, and ownership group are all well aware that, even though the Nuggets finally grabbed a win over the Rockets, their work is far from finished. The Nuggets have much bigger goals that a single regular season win over the Rockets, but that does not make this win any less sweeter. Now, the Nuggets can keep on keeping on. They have won seven of their last eight games, finished out a brutal January schedule with a record of 12-4, and now are back in the driver seat for the first seed in the Western Conference with a record of 36-15. While many people around the league thought that the Nuggets may have faded away after their strong start, Denver is still where the have been longer than any other team in the NBA; at the top of the Western Conference standings.